So what do you think? What are a few YouTube recruitment channels you like? Do you have a social recruitment strategy for YouTube? Don’t forget to share it all in the comments below! 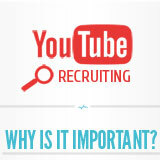 nice infographic, looks like youtube can have a great impact on recruiting. YouTube is a great tool for recruiting! Glad that you liked the infographic. Pingback: Facebook Fan Page Timeline Image Dimension and Cheat-sheet [ Infographic ] « @HireRabbit Social Recruiting Blog!